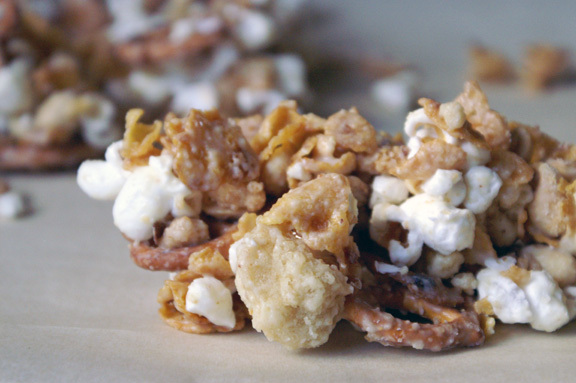 That’s right, people: I took my favorite Momofuku elements and tossed them together in what I think may be the greatest salty/sweet snack mix of all time. It’s relatively easy to put together, makes an absolute ton if you want it to, and fantastic for setting here and there at parties. What’s more, it stays fresh for a good long time in the fridge, which makes it pretty great for gift-giving. Just think: you could be the talk of the family with your food gifts this year, because although they’ll understand what peanuts and popcorn and the like is, do you think they’ll have any idea how you made those cornflakes that crunchy? No, they won’t. Will they ask you over and over what those crazy vanilla cake-flavored clusters are? Yes, they will. You can spend the entire holiday season shrouded in mystery, all because of this snack mix. But wait; did I say Momofuku? I did, but this isn’t anything difficult; it’s simply two of the mother recipes – the crunch and the crumb – baked up and throw in here with the other elements. If you’ve never made it before, the cornflake crunch is simply cornflakes tossed with some butter, brown sugar and powdered milk and baked up until it smells like warm, buttery popcorn. The confetti crumb is slightly more involved from an ingredient count, but it’s really just some dry ingredients, some wet ingredients, a spatula, and a baking sheet. 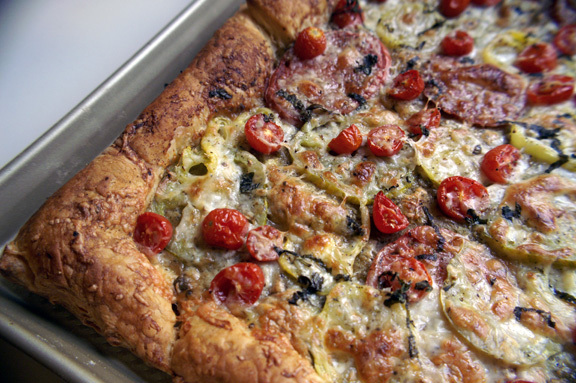 If you’re making this just for yourself, feel free to make half of the recipe: you’ll still have plenty. For big gatherings, out-of-town guests, or gift-giving, make the whole batch and either throw it in a big bowl (party application) or wide-mouth quart Mason jars (gift application) and you’ll be all set for the holiday. I got so excited to tell you about this that I haven’t even told you what it’s like. 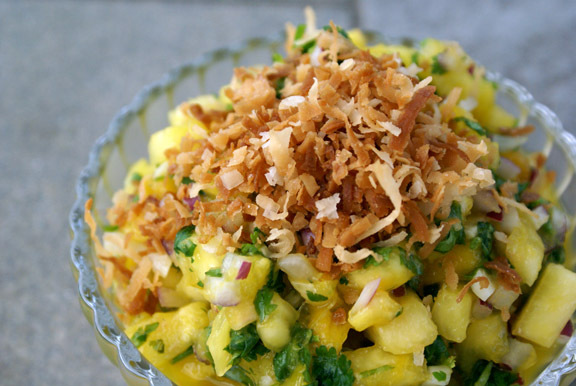 It’s incredibly addictive: an enormously flavorful combination of sweet and salty, and it hits all the marks a good a good holiday mix should. 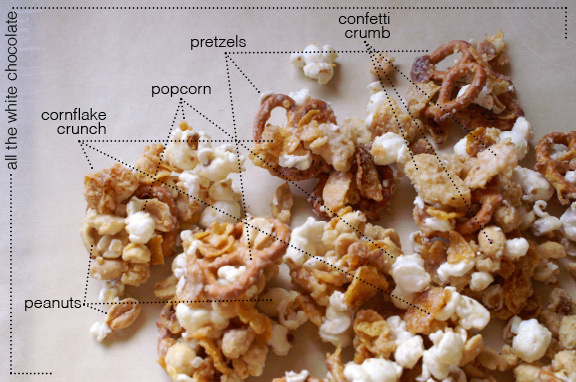 You have a variety of texture: soft give of the popcorn, malty snap of pretzels, peanuts and cornflakes adding crunches each their own. The confetti cake crumb is superb, because it adds a cookie flavor with a solid sweetness which plays nicely with the salt off the other components. The white chocolate does a great deal of work in bringing the whole thing together: it coats the whole mess with a paper-thin but effective vanilla softness, sealing in the flavors and blending them together as one. It also gathers the whole lot up into clusters you can break into big or little pieces (once everything has chilled down), so everything sticks together exactly how you want it. My *ahem* exhaustive research seems to indicate that you’ll never get any less than 4 elements per bite, most of the time more, which means you won’t be picking around for your favorite parts; they will come to you. I’ve had a request to post one more thing here before the holiday (aside from this.) I plan to honor that request, so I’ll leave you with this and begin writing the next one. Stay tuned for it, because if you’re interested in a cranberry + grapefruit sorbet that will blow your mind, that will be up in a few days. Until then…snack mix. *did you know that – at least with Rold Gold brand which I prefer – that the fat-free “tiny twists” miniature pretzels are actually MORE miniature than the regular version? I’ve been fascinated by this for years, ever since i noticed the difference. Why would they do that? In any case, I use the smaller of the two, so the fat-free variety is what you see pictured. **I say this because everyone has a different idea of work and also of how thick a layer they like their chocolate coating. I like to use 8 ounces, which is what you see above: it takes some patient folding/stirring to get it all in there evenly, but it’s worth it. If you want more chocolate, go for the 10 ounces. 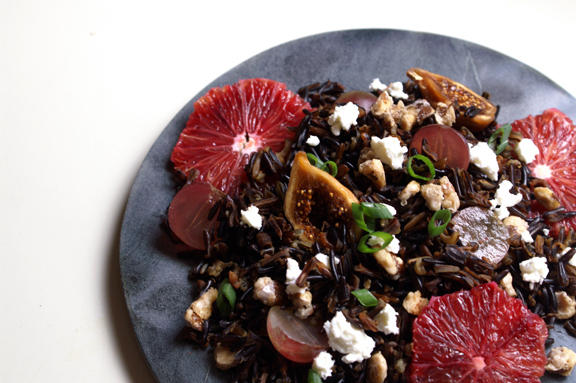 Is it too much of a pain to link you to the crunch and crumb recipes elsewhere on the blog? I don’t normally do that, but i felt like i wanted this to be a short recipe, visually. If you hate it, let me know and i won’t do it again. Line a lipped half sheet pan with parchment paper and set aside. Do this how you wish, but white chocolate can be finicky. I like to do this in a double boiler over just simmering water, being careful that the top doesn’t touch the water below. Stir occasionally until chocolate is completely smooth. Meanwhile, in the largest bowl you own (or possibly two, because you’ll need stirring room; a big soup pot works well for this also), add the popcorn, peanuts, pretzels, cooled confetti crumb and cooled cornflake crunch. Toss with your hands to evenly incorporate. Once your chocolate has melted, bring it over to your bowl of things. Be ready with a spatula, because you’ll need to work quickly. Pour the melted chocolate over top of your snack mix (or divide it up over your two bowls, as evenly as you can) and use a folding motion to incorporate the chocolate onto all the components. You don’t know what a folding motion is? Think of it like you’re sliding the spatula down the inside of the bowl all the way to the bottom, then you’re flipping it up and over, pushing it back in gently as you go. rotate the bowl a little bit, and repeat, repeat, repeat. If you have two bowls going on, do a few flips in one, then flip the other, and back and forth. Watch for straggling dry ingredients or, alternately, clumps of chocolate, and work to incorporate those as you go. Once you’re done, spread the whole thing out on your prepared sheet pan (one half sheet pan will do it, it doesn’t have to be a single layer) and place in the refrigerator for about 20 minutes to harden. After that, break it up into pieces and store it in an airtight container in the fridge until you’re ready to snack. It keeps for a ridiculous amount of time: as I type this, I have a few pieces of it in front of me (I’m a method food blogger), and it’s still good: I made this close to 2 weeks ago. I’d say eat it within a week, but I know you won’t get rid of it after that, so you’re probably safe (for personal use) for 2 weeks, properly stored and refrigerated. This is a wonderful idea! I weep with joy. Mary Rose! I have missed you! It was a fun idea, and one i needed to execute, just to see if it would work. I had a hard time picking which combination of crumb and crunch to use, and i still would like to try it with the chocolate crumb (because, delicious) or maybe a different crunch, just to mix it up. this is totally one of those “possibilities are endless” things. I never noticed the miniature fat-free pretzels were smaller than the ones with fat! We do buy Rold Gold (and the Snyder brand, too) miniature ones when using in a mix like this or Chex Mix. I’ll have to be more observant! Fun opening to your post, and tasty throughout. 😉 I often have some of what I’m blogging about in front of me when I write, too — inspiration! Good post — thanks. Always good to eat and work: people think it’s an excuse to eat treats at weird times of day, but i call it research. I come up with much better ways to describe it if it’s right there with me, i find. Oh my goodness! Momofuku enchantment just in time for the holidays! I have been looking for a new sweet to add to the family favorite cookies and this just might be it! If a batch doesn’t get eaten as soon as it is made this snack mix would be a great holiday gift! yay for momofuku enchantment! Definitely a fun gift to give for the holidays; i plan on making up a batch or two specifically for that purpose: i figure people love cookies, but this is something different, and it’s nice to mix it up. We must be related in one of our lives! I used to sing this song to my kids at bedtime. Of course, now they pray I won’t start singing! I love this snack mix. Ordinarily, i am not a snack mix person, but this could be my conversion! I’m not always a snack mix person myself; i like my snacks mostly singular in nature, but this is one of the exceptions. I love it, and i hope you will too. I’m going to file this away as an idea of something to throw into my Purim food gift baskets in March (you know me, always planning this kind of stuff crazy-far in advance). p.s. LOVE the term “momofuku’d”! You know, Faygie, i felt that same pull towards the Milk Bar cookbook a few weeks ago, so i must be sending my energy your way! 🙂 I realized i missed it, and i had been away for too long; i haven’t made so many things in it, and i need to get on it. doesn’t “momofuku’d” just fit? it seems like it should be an official term for things. First of all, your song at the beginning made me so happy! I literally squee’d with joy. Also, I love that you noticed that the fat-free pretzels are smaller than the regular ones… sounds like something I would do! This mix sounds utterly addictive. I feel like it could go either way — perfect for sharing with others OR for hoarding all to yourself and eating in one go. Err… maybe that’s just me? What I’m trying to say is, I am a sucker for sweet and salty clusters of crunchy goodness. Well, i fear i went the latter direction with it: it’s safe to say this batch did NOT get shared much with others. But the next batch, for sure…i’ll share the next batch. 🙂 it’s not just you. You Blow My Mind and Tastebuds ALL OF THE TIME! Yes! You do! I’m totally making this for the party AND gift applications (mason jars, I heart you!). Plus your recipe for the Momofuku holiday cake balls, because, well, how could I resist? I love it that you capitalized that! YOU ARE SO SERIOUS RIGHT NOW ABOUT THIS SNACK MIX. 🙂 And the cake balls…those were so good; someone pinned those the other day and i feel like i should make them. I love that about Pinterest; i get reminded of past things that i sometimes forget about due to excitement about FUTURE things, and so it goes. Ashley, i am ALL about keeping the nerdy real around here. Hey, if it happens in february, at least it happens, right? And what a great way to lift the mood of an otherwise semi-dreary month; fun snack mix! Someday, we’ll do a momofuku project together. because sometimes it really falls into the “project” category when you’re dealing with that book. I’ve made a bunch of things from it, but in reality, i haven’t even scratched the surface, because there’s tons of things in it. don’t tell anyone, Amy, but i actually had to throw the rest of my batch out after i scarfed it for days on end: way too good to just have it sit there unattended; you will eat all of it. half-batch for you, or make it when there’s enough people to help you with it. *ahem* i think i gifted myself this snack mix too. whoops! guess i’ll have to make it again! Or we could just each make this, and send it to each other. PERFECT. I am going to make this and put it in pretty jars and give it to people for Christmas. No question about it. The first party we’re going to is on Friday night. Host gift! me tooooo!! because it’s easy and it makes about ten thousand cups of snack mix. could NOT be easier or prettier. Hi Shannon! I just discovered your website/blog through pinterest with the “sweet and salty” mix… I am an avid hobby cook at home, and my husband is a professional chef/owner at a very successful restaurant in west Michigan…so I DO have a lot of help in the kitchen. In fact, we recent purchased the Momofuku Milk Bar cookbook and I was super excited when I saw this recipe was inspired by it. (I am still conjuring up the courage to make the Momofuku carrot cake!) Anyway, I made this mix last night with 95% success… I just have one concern/question for when I make more… My cornflake crunch… while tasted AMAZING, was very crumbly and when I mixed it with the rest of the ingredients and white chocolate, a lot of it was left “loose” and unattached to the other parts… some did stick, but most did not. I am thinking I broke the pieces too small or maybe need to bake it more in a “packed” form versus in a thin layer? any advise?? First let me say how lovely it must be to have a pro chef in your midst! that’s wonderful, for sure. Congrats on your purchase! I hope you love it: i’ve had so much fun with that book in the two years i’ve had it now, and i’m looking forward to more adventures with it (that carrot cake? INCREDIBLE, you must try it). Okay, so the cornflake crunch. First, sometimes it’s the brand: I like Kellogg’s because they seem the most sturdy as compared to Post or any other store brand. Then, and you touched on this, there’s the piece size: the more you stir it, the more it does break into smaller parts. Start with when you initially put it together, and make sure that you’re using the biggest flakes in the box (typically it would be the top section). second, yes: i like your idea of the compact bake, because that’s how i normally do it: always touching, never too spread out. You do have to be gentle/firm when folding it in with the other ingredients, because if anything is going to stay unattached, it’s that. Try this: when you’re putting it together, make the cornflake crunch the top ingredient in the bowl prior to pouring in the white chocolate. That way when you drizzle the chocolate in, by default it’s coated the cornflake crunch, making it guaranteed to adhere to everything else. batch #2 turned out better. I had Kellogg’s both times… but the second time I did not break the flakes apart, but mixed them whole in my kitchen-aid with the other ingredients, I felt this broke them down just enough. Then, as you (and my hubby) suggested I put them ON TOP of the bowl when I poured in the chocolate. the chocolate coated the corn flakes, and then the white-chocolatey-cornflake-crunch went on to coat all the other nuggets of deliciousness in the bowl. Also, with batch #1, we were anxious to EAT it, and probably messed with it and broke it apart before it was set 🙂 This time I let it set firm in the fridge.